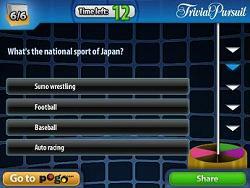 With this free Trivial Pursuit game, test your trivia knowledge while racing against the clock. This game trains your memory skills and logical reasoning. To begin, click the Small, Medium, or Large link or Very Large button or HTML5/Mobile link under the picture at left. This opens the game in a pop-up window. The HTML5/Mobile version Trivia Quiz works on desktop computers and tablets. It is a similar game by a different game developer. Each round of this game consists of six Trivial Pursuit questions. Click the "Start the Game" button to begin. If you like this game, you might enjoy the other free memory games on this site, such as Wheel of Fortune, Lightning Librarian, and Brain Safari. HOW TO PLAY. Your goal is to earn all six slices. Do this by correctly answering a question from each of the six Trivial Pursuit categories. The six categories are Geography (blue), Entertainment (pink), History (yellow), Arts & Literature (brown), Science & Nature (green), and Sports & Leisure (orange). Click the "Continue" button to display the first question and start the timer. You have 15 seconds to answer each question. To answer a question, simply click the correct answer from the four answers displayed on the screen. At the end of the game, you receive a Rank based on the number of questions you answered correctly. Click the "Play Again" button for a new set of questions. Or click the "Go to Game" button to play the full version of Trivial Pursuit at Pogo.com. Trivial Pursuit was invented in 1979 by newspaper and magazine editors Scott Abbott and Chris Haney. According to legend, pieces of their Scrabble set were missing, so they decided to come up with their own game. Question sets are available for specific genres such as Star Wars and Lord of the Rings trivia. In 1984, at the height of the game's popularity, over 20,000,000 sets were sold. In 2008, the Hasbro toy company bought the rights to Trivia Pursuit from Parker Brothers for $80,000,000 US. The original version of Trivial Pursuit is referred to as the Genus Edition (not "Genius" edition, as a recent visitor to this page pointed out). Many more editions have been created and sold over the years. The Trivial Pursuit board game is a lot of fun and is usually available wherever board games are sold. If you've never played, I highly recommend you try it! This free Trivial Pursuit Blitz game and the real Trivial Pursuit board game are both excellent brain games, very useful for testing your memory for random facts. Game distributed by Pogo.com. Used with Permission.